Dr. Bonita Lawrence explores institutionalized racism, cultural genocide, and the history of aboriginal policy in Canada. Highly recommended viewing. Dr. Bonita Lawrence (Mi’kmaw) is an Associate Professor at York University, where she teaches Native studies and anti-racism. She is the author of “Real” Indians and Others: Mixed-Blood Urban Native People and Indigenous Nationhood (University of Nebraska Press and UBC Press, 2004), and co-editor (with Kim Anderson) of a collection of Native women’s scholarly and activist writing entitled Strong Women’s Stories: Native Vision and Community Survival (Toronto, Sumach Press, 2003). 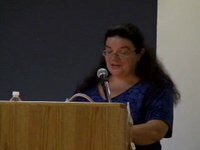 In her talk, Dr. Lawrence explores “aboriginal policy”, the historical framework through which Canada has sought to erase the identity of Indigenous people, by systematically breaking down their cultures, belief systems, community and family structures, and their governments—in many cases, at the barrel of a gun. She hones in on three specific occurrences in the 19th century for causing the most damage. First was Canada’s refusal to deal with Indigenous confederacies. Instead, the government singled out individual villages, around 620 altogether—which allowed the govenrment to politically, socially and economically segregate everyone across the land. Then came the banishment of Ceremony and the removal of strong Leaders, all of whom were over time replaced with “Christian converts” and individuals willing to represent Canada’s short- and long-term interests. Finally, there was the political, social, and cultural disempowerment of Indigenous Women—and the forced assimilation of children—which allowed for the erosion and replacement of the fabric of indigenous identity. While these “keystone” events have past, Indigenous communities are still struggling with their consequences. Indeed, many indigenous people still aren’t even sure who they are. Meanwhile, the historical policy continues. Lately it’s taken the shape of private home ownership on treaty lands, a scheme that will inevitably and openly break treaty lands apart—lot by lot, as banks foreclose because a single mother can’t pay her mortgage (then the house is sold to a… white family), and so on. The policy has also been focusing on holding Band Councils to account under the Canadian constitution. While these seems like a rational thing to do, this scheme similarly helps to breakdown Indigenous society in Canada. It’s the advancement of Canada’s historical effort for absolute control over indigenous communities. It’s like putting a dog on a chain, so the Canadian thinking goes. As long as the government has a stick hanging over his head, it’s only a matter of time before he does what he is told. This is where resistance comes in—however, not the kind where you hold a banner for a couple hours and then hope for the best. The resistance here comes in the form of a process of “removal, replacement and growth.” It is an organic process, which means it’s one that we carry out at our own pace and in our own way as members of our own community. This is all easier said than done, but that makes it all the more necessary. If we do not carry forward such a process, then in no time at all, perhaps 3 generations from today, “the Canadian Dream” will become our everyday life. There will be no Indigenous People in Canada.